From Peter Stuyvesant to Mayor Bloomberg, New York City's history is full of vibrant characters, riveting events, and fascinating controversies that reflect shifting economic, political, social, and cultural currents within New York's long history. The Restless City Reader: A New York City Sourcebook uses primary and secondary sources from a variety of perspectives to illuminate the issues that have affected the city and its people. 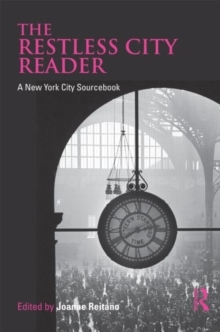 The Restless City Reader can be used alone or with The Restless City, a short narrative history of New York from colonial times to the present. With a helpful introduction and document head notes, as well as study questions and suggestions for further inquiry, The Restless City Reader is a short, engaging, usable collection of sources for students, professors, and anyone interested in the city - its dreams, its challenges, its voices.